I’ve talked about my love for my yoga practice a million times over and over here on this blog, which is why I’m thrilled to share an update on an awesome Cleveland event happening all summer – Yoga Rocks The Park! Living in a Northern city, when the weather gets nice, it’s ridiculous to do anything inside that can be done outside. It’s a little bit of the reason why my Yoga practice at Inner Bliss wanes. I mean, when it’s -30 degrees outside, NOTHING sounds as good as getting bendy in a 100 degree room. When it’s 90 and sunny out? Not so much. So, the solution to this problem? 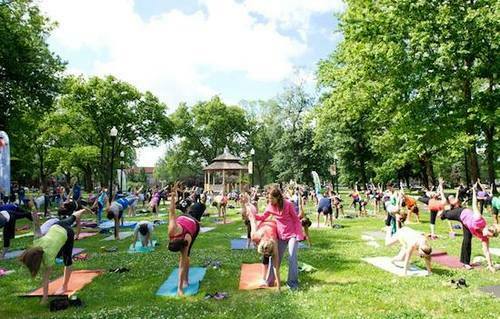 Yoga Rocks The Park, taking place all throughout Summer in Tremont’s beautiful Lincoln Park. For $15 pre-registration or $20 at the event, you’ll find a great mix of Saturday/Sunday Morning/Evening classes to fill your yoga need. Live music will partake at a few of these as well. Yoga Rocks The Park has been kind enough to offer 2 passes to any of the classes above so 1 winner and a friend can attend a complimentary class. Tweet me (@nadinenocero) and Yoga Rocks The Park (@YogaRocksCLE) and share your favorite pose and place to practice yoga! Leave a comment with the same details requested in the tweet. 1 entry to win, winner will be announced on Friday, 6/20/2014. Only open to Northeast Ohio residents. I hope to see you at one (or many) of these glorious sessions! Full Disclaimer: I have been asked to be an official blogger for Yoga Rocks The Park and have been given free classes in return for promotion and giveaway.